These digital spaces are now historical relics; the stylised medieval imagery refers to this explicitly. 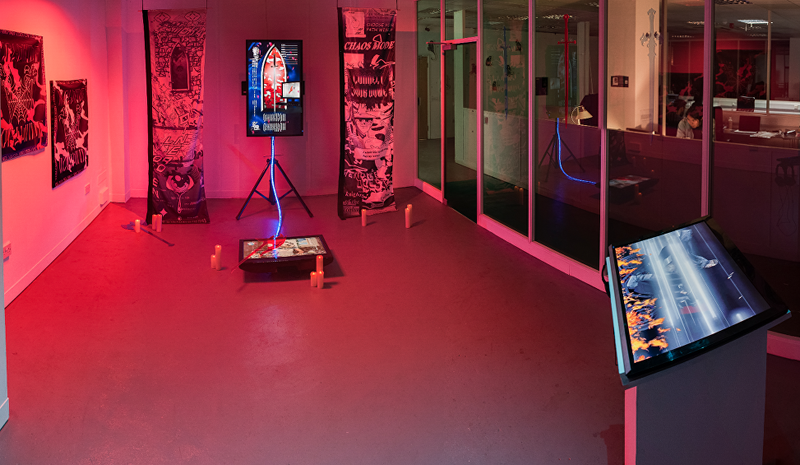 Using what is an inherently romanticised visual style the work discusses the obsessive culture around MMORPGS, the customisation of self and the allure of leading a double life. The banners in the installation act as symbols or ‘check-points’, the calling cards of make-believe tribes. Both historical and contemporary, they act as physical versions of the banner ads we see daily on online platforms, bringing an army of virtual users back into our world. For many, being part of this type of similarly-minded group acted as therapy, a way to escape the mundanity of life or a complete social awakening. For those invested in the online communities, the worlds they inhabited often became blurred beyond reason, receiving just as much, if not more attention than the ‘real’. To have these parallel lives taken away was unimaginable. This exhibition marks the end of Hotel Generation, the six month long exhibition programme featuring emerging artists from around the UK.Knights of Omikron is part of arebyte LASER's 2017 programme titled hotel generation - a series of exhibitions by a generation of young artists from around the UK, all responding to either contemporary Ordinaryism, information overload, collective practice or reacting to the 'extreme present'. Marc Blazel lives and works in London. He has studied at Brighton University and Central Saint Martins. 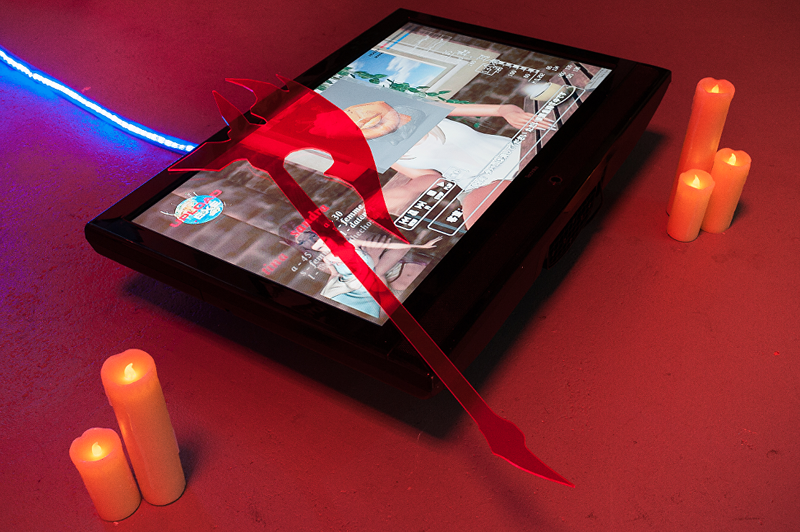 His practice explores the boundaries between online and IRL. 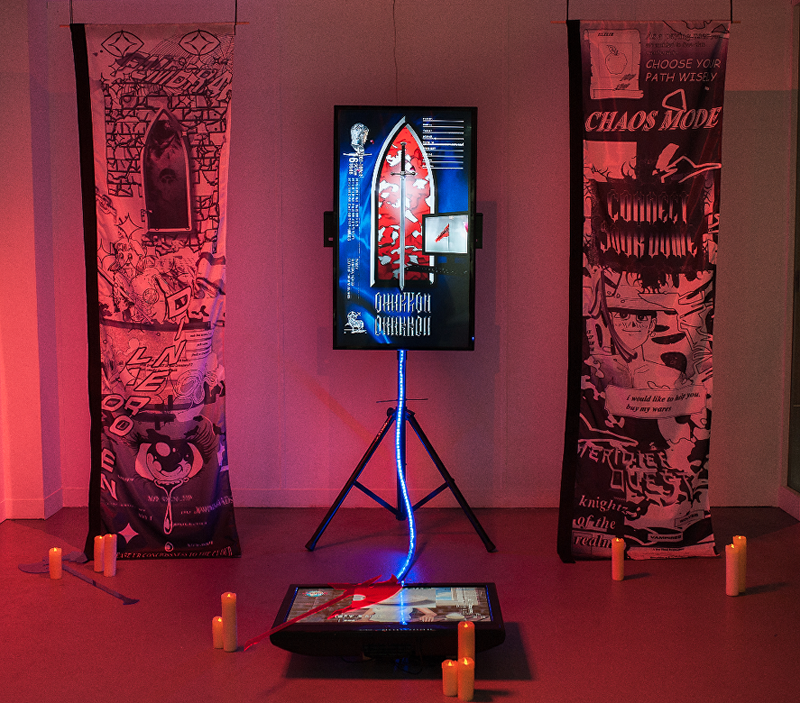 His current research investigates parallels between the decline in self sufficient online communities and the closure of DIY and community spaces in the UK. Using video, live-streaming and image making Blazel’s work instigates a pop-aesthetic of diaristic writing and anthology. Stelios Ilchouk is a multidisciplinary artist with an interest in narrative and abstract illustration, sound-design and experimental film. He was born in Cyprus, Paphos and moved to London in 2012 to study the Foundation Diploma in Art & Design at Central Saint Martins. In 2016 he completed his BA in Graphic Design at the same university, specialising in Illustration.